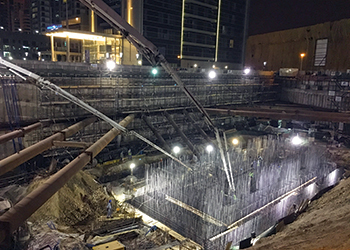 Golden Readymix ... supplied to Dubai Creek Harbour Phase 1A. The present owners acquired the company just one year ago, said E R Menon, CEO of Golden Readymix. “The past one year has been utilised for restructuring the organisation, upgrading facilities and acquiring new plant and equipment. We have also enhanced the management structure and brought in a most experienced team of professionals into the company,” he explained. Commenting on the company’s performance since this move, Menon says it can be classified as beyond expectations during this short period of time. “Our production has increased threefold and we are now in a strong and commanding position to take on the next few years of the active construction market,” he said. The company has also bagged a number of prestigious projects like the Dubai Creek Harbour Phase 1A, comprising six residential towers and podium; Viceroy Dubai; Hameni Tower; Green Community west extension Phase One, Two and Three; Rove Hotel; Lapita hotel and Dubai Parks and Resorts; Project Star HSBC; DS 150/2-Jebel Ali sewage treatment plant Phase Two; Crowne Plaza Hotel and Circle Mall, all in Dubai. A project at Jumeirah Village undertaken by Golden Readymix. “If it’s a mobile pump, concrete is directly pumped to the location of placement, subject to the above being within the reach of the boom. If it is a high-rise building, static pumps are used to pump through vertical risers, installed in the building, which is usually connected to a placing boom, erected at the top of the building. This boom along with static pipeline is hydraulically climbed upwards as the construction progresses. The company designs, manufactures, supplies and offers pumping services to the construction industry. Readymix concrete is delivered to the construction project sites in transit mixers and concrete from the mixer is usually discharged into the hopper of a mobile or static pump. 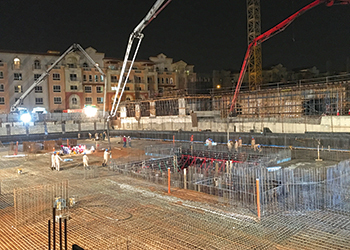 “We offer all the above services up to placing concrete, where it is required,” said Menon. Over the last one year, the company has acquired a 50 per cent share in Precast Concrete Products, a state-of-the-art precast concrete manufacturing facility in Techno Park, and Advanced Laboratory Centre, a fully equipped and DAC-ISO 17025-accredited independent testing laboratory company. GRM is also in the process of acquiring a quarry. Commenting on the company’s future plans, Menon said: “Our company plans to set up branches at Dubai Industrial City, Al Quoz and the Hamriyah Free Zone in Sharjah. We also intend to acquire additional plants and equipment to handle the increased production capacity. Rove Hotel ... a Golden Readymix project. 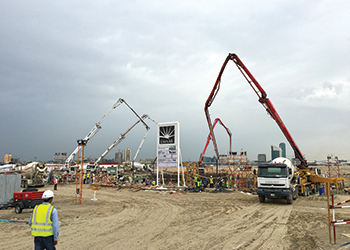 Golden Readymix was established in Jebel Ali Industrial Area 2 in 2007. “We take pride in very job no matter how big or small the project is, and we stretch our limits to deliver the best. Our team of specialist professionals pay close attention to client requirements and ensure that they are provided with the right solution in a timely manner. Our aim is to form strategies, lead effectively and work constructively to perform where others cannot and to make a difference to the industry we are in,” Menon adds.